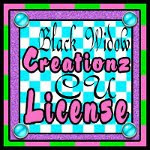 ♥ I Love Lucy DigiArt Designs ♥: MY NEW BLINKY! My good friend Leah made me a blinkie! Thank you Leah!! !